Did you know that you can pick up wings, burgers, and cold beer on your way home from work, all without stopping at the grocery store? That’s because Buffalo Wild Wings® is giving beer-to-go a shot at their locations near you. You’ll be able to get a six-pack of cold bottled beer along with your takeout order. Lots of customers like to stop by their local Buffalo Wild Wings for burgers, wings, appetizers, and other restaurant staples to take home. But most customers also love a cold beer with their meal. So why should they have to make a separate stop after the restaurant to get beer to go with their wings? Buffalo Wild Wings is testing out the option for customers to order a six-pack of cold beers-to-go when they place a take-out order. Now you don’t need to make a second stop—you can get it all right at the restaurant. Beer-to-go is also a great solution for food and beer emergencies, like a last-minute get-together with the neighbors, or your in-laws dropping by for dinner. Imagine how crowded the liquor and the grocery stores are at 5:30 pm. Just stop by a Buffalo Wild Wings restaurant and pick up tonight’s drinks and snacks there instead. It’s a one-stop shop for your cold beers and your sports bar bites. Check out the Buffalo Wild Wings website to find the location nearest you and check out their list of bottled beers that you can get to-go in a six-pack. 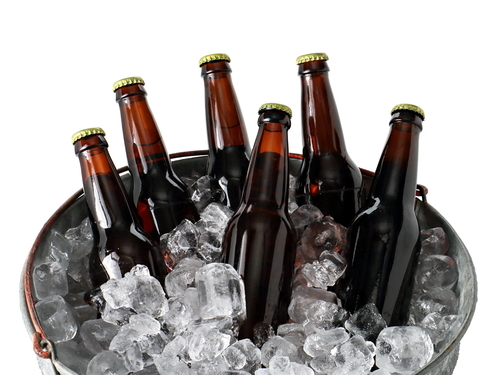 Every location has a great selection of both domestic and imported bottled beers, so there’s something cold and refreshing for everyone you’re eating with. Don’t forget to order your burgers and wings, too, and choose from a selection of more than 10 amazing wing sauces and spice tosses.